This blog post is based on two different assignments from the Blogging University Writing 101 Course. I’m combining Assignments 14 and 15. The first assignment was to open the nearest book to page 29, pick a word that jumps out at you and write a letter to someone regarding the thoughts or ideas that you got from the word. I chose the word horses from page 29 of These Happy Golden Years by Laura Ingalls Wilder. The second assignment was to imagine that an event which shaped my life and worldview was being cancelled forever, and write about how it made me feel. I chose to write about Spring Ridge Sunday. Part family reunion and part church homecoming service, Spring Ridge Sunday is a real even held the first Sunday of each May in the rural hills of Catahoula Parish, Louisiana. Though the tiny one room church doesn’t have regular services any more (and hasn’t since the 1940’s), the ancestors of those original members still come and fill the pews to sing, pray and gather in worship on that one Sunday each spring. Every year I look forward to attending as a way to connect my daily faith to the legacy of God’s faithfulness throughout the generations. (Psalm 119:90) I cannot imagine my little world without Spring Ridge Sunday. I suppose you’ve heard the news by now. Can you imagine beginning the month of May without Spring Ridge Sunday? How can that possibly be? I suppose I can count on one hand the years I’ve spent the first Sunday of May some place other than Spring Ridge Baptist Church. It’s simply always been a part of my life. Do you remember the spring we all had the chickenpox? Mother wouldn’t let us go that year. Who could blame her? All of us were still covered in spots which were in various stages of healing. You and I were as mad as the proverbial wet hen. We begged and pleaded, but Mama stood her ground. It was one of the few years we stayed home from the annual Spring Ridge church services. Hard wood benches. Humid Louisiana springs. Swatting at flies and fanning with the old cardboard fans provided. What was it that made us love Spring Ridge Sunday so much? Fascination with the old outhouse? Maybe at some point. For a few years I felt sort of like Laura Ingalls Wilder, as though I had stepped back in time. The lack of indoor plumbing was … well, it gave me an appreciation for more modern conveniences. Thankfully, the charm soon lost all appeal. Ma’s chicken and dumplings? Oh, definitely! You could only get that particular delicacy three times a year. Spring Ridge Sunday, Papaw’s birthday and Harvest Day Homecoming Service. I can still taste the deliciousness of those dumplings. I guess it was more than just the chicken pie though. Seeing all that food spread out on the make-shift tables, piling plates high with food, sitting on lawn chairs, visiting with people who I wouldn’t see for another year. Dinner-on-the-grounds was certainly a Spring Ridge Sunday highlight, but not the real reason behind the event. The sermons? Some years the sermons were encouraging. Other years … well, not so much. I still laugh every time I think about that poor preacher who couldn’t find his text. He flipped all over his Bible, and never did land on the verse he promised to read aloud. Part of the fun each year was guessing what sort of preacher might show up to share God’s word with us. But that certainly wasn’t the reason I wanted to attend those once-a-year church services. The history behind the service? Well, certainly there are some interesting stories to come out of that small church in the middle of the piney woods. Do you recall how Ma used to tell of the horses neighing whenever they heard the congregation begin to sing the words to the parting hymn, God Be With Us ‘Til We Meet Again? Still, just history itself isn’t reason to go back to Spring Ridge again and again, year after year. The people? Oh, I love so many people who came to Spring Ridge. It was as much a family reunion as it was homecoming church service. But there were just as many unfamiliar faces in the crowds, people I didn’t know and never found the time to meet personally. The ones I really cared about I could always find other ways of keeping in touch rather than continuing to drive 20 miles into the rural hillside of north Louisiana on a particular Sunday in May. So what is it that made Spring Ridge Sunday so special? 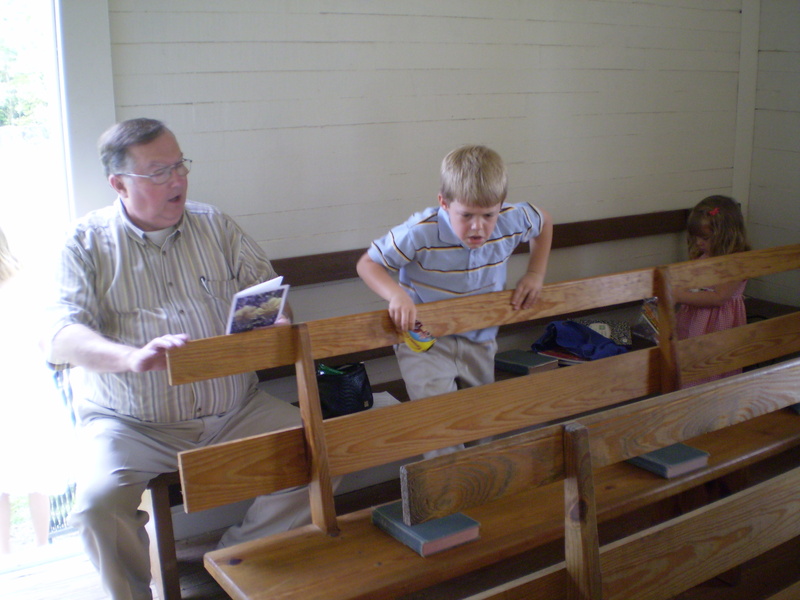 Why continue to travel the dirt roads to the old one-room church house, year after year? Why does it feel so wrong to know Spring Ridge has been cancelled forever? To the best of my reasoning, it has to do with my favorite part of Spring Ridge Sundays … the recognition of the original families who attended the old church. It’s the same each year. As the old church roll is called, those who have returned stand up when they hear the names of those who came before them. Some names are called and no one stands. But not for Jim McGuffee and Minnie Belle Allbritton. The wooden floorboards shake as half the crowd rustles to their feet, paying homage to the faith of two simple people, husband and wife, who raised their children to love the Lord. The Bible is clear. You can’t get to heaven on the coat tails of your parents or grandparents. And yet God is promises to show love for a thousand generations to those who love Him and His ways (Exodus 20:6). This is the reason I love Spring Ridge Sunday. It’s a reminder of God’s promises. It’s a reminder of where my family has come, that I am who I am because someone who lived long before me decided to love God … and because of that decision, I have come to know a personal Lord and Savior as well. Oh, I know. The cancellation of Spring Ridge Sunday won’t change any of those things. It certainly won’t change my relationship with Jesus Christ or my personal faith in God. Still, I know every first Sunday in May, I’ll pause and give thanks to the generations before mine who loved the Lord. My our generation do the same for those who will follow us.